This factory building was constructed in 1902 on the corner of 13th Street and 8th Avenue for V. Martinez Ybor & Co. as the Stemmery building, named because it was where the tobacco stems would be separated from the leaves. It was an addition to the original V. Martinez Ybor & Co. factory complex originally built in 1866 that eventually consisted of three buildings on the same block, the last one buit being the warehouse building where the Spaghetti Warehouse restaurant is today. Michael Stachelberg (1835- ) was a Prussian immigrant who arrived in the US and established himself and his family in New York City. and in 1857 established M. Stachelberg & Co. as evidenced by this ad . According to the case Stachelberg vs. Ponce resolved in 1888, Michael Stachelberg and Asher Bijur established a partnership in New York in 1873 under M. Stachelberg & Co. unbrella to continue making the La Normandi brand Bijur had made since 1855. Upon Michael's death on April 4, 1895 his son Charles G. Stachelberg (1865-1900) took over the firm which got to employ more than 300 cigar workers making Clear Havanas at their factory at 154 S. 5th Avenue in NYC and imported cigars from Cuba. Charles died unexpectedly just five years later when his brother Edgar J. Stachelberg (1867-1939) became the principal of the company. In 1902 M. Stachelberg & Co. had outgrown their location in West Tampa from where, as reported on this March 28, 1902 edition of Tobacco publication, they planned to move to a new factory on Lafayette (Kennedy) Street, move that never happened. M. Stachelberg & Co. and Esberg, Gunst & Co., consolidated prior to 1908 but each one continued to operate a factory in Ybor City both of which burned down March 2, 1908 according to this NY Times artice . This May 1908 article on the edition of the Tobacco Leaf publication stated that the Stachelberg-Esberg-Gundt combination acquired a piece of land on 19th Street between 2nd and 3rd Avenues from P. San Martin & Co. to build a new cigar factory, however it seems the construction plans never materialized as the Corral-Wodiska & Ca. factory building was constructed in 1909 for the Esberg-Gunst Cigar Co. at this site. The M. Stachelberg & Co. did lease the building pictured below and remained a tenant until March 28, 1932 when they ceased operations in Ybor City and relocated to Trenton, NJ. 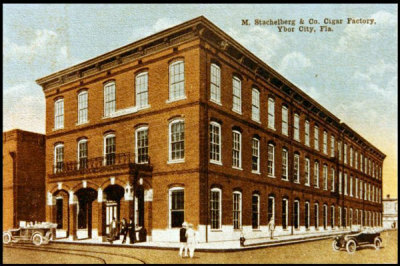 This picture identifies the M. Stachelberg & Co. factory building, which name is often confused with that of Seidenberg & Co ., certain sources have incorrectly identified them as being one as the same.